As Alberta heads toward an election campaign, Premier Rachel Notley used Monday’s throne speech to emphasize the accomplishments of her NDP government over the past four years. As Alberta heads toward an election campaign, Premier Rachel Notley used Monday's throne speech to emphasize the accomplishments of her NDP government over the past four years. 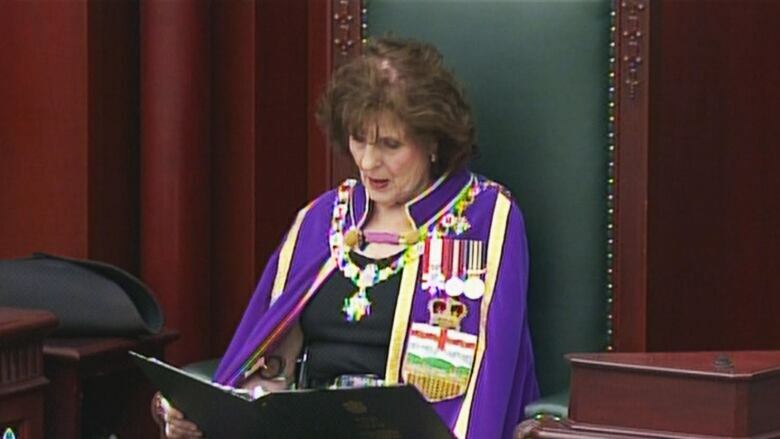 The speech, read to the legislature by Lt.-Gov. Lois Mitchell, emphasized that the NDP formed government just as the bottom dropped out of international oil prices but made choices to put ordinary Albertans first, not just the elites served by past conservative governments. "Our throne speech is about these kids," Notley said of the children who attended her pre-speech news conference at the Royal Alberta Museum. "It's about their parents. And it's about families in Alberta. It's about making sure that we build an Alberta that includes all Albertans." The speech was driven by that theme. Past governments, the speech said, followed the same old pattern of making cuts that hurt vulnerable Albertans, creating a divided society. But things changed after Albertans elected an NDP government in 2015, ending 44 years of governance by the Progressive Conservative party. "Together, we have done away with the entitled, broken politics of the past," the speech said. "Together, we are taking control of our future, breaking away from the devastating cycles of boom and bust and setting our province on a more diversified, modern and resilient foundation. "We cannot — we must not — allow two different Albertas to form: One for the wealthy and one for everyone else." Throne speeches typically lay out the government's agenda for the upcoming legislative session. This one could also be seen as establishing themes for an impending election campaign. Notley has been tight-lipped about whether the Legislature will continue sitting beyond Monday or if she will quickly call a spring election. Under the province's fixed-date legislation, the next election must be held before May 31. The latest version of the order paper lists seven bills that are awaiting introduction in the House, including interim supply and supplementary supply bills, which would fund the government until a budget can be introduced. The government grouped the review of its record under four main themes: restoring trust in government, creating jobs in a more diversified economy, making new infrastructure investments and building a province that works for everyone. Efforts to get the Trans Mountain pipeline expansion built were highlighted, as was the government's plan to ship oil by rail as a stopgap until pipelines are fully operating. The speech talked about the government's move to end perks and high salaries for executives at agencies, boards and commissions, as well as cutting its own travel and hospitality expenses by 80 per cent. It also highlighted the government's push to build or modernize 240 schools across Alberta. There were only a handful of new announcements scattered through the text. The government intends to introduce measures aimed at cutting health-care wait times, making prescription drugs more affordable to seniors and strengthening "the rights of women to get critical health services." Bill 1 would be introduced to prevent Alberta from moving toward the private health-care model seen in the United States. The government also dropped hints about at an affordable child-care program. During a news conference following the throne speech, UCP Leader Jason Kenney said the speech failed to address "issues that matter most to Albertans." "Today's throne speech said nothing about about this jobs crisis, nothing about this economic crisis, nothing about getting Albertans back to work and nothing about bringing jobs back to Alberta," Kenney said. Kenney concluded his statement by urging the NDP government to call the election. "I repeat the same call I've been making since Feb. 1: Stop the charade, stop hiding from voters, call the election." he said. Following the throne speech, Kenney also fielded questions related to allegations that his campaign collaborated with fellow candidate Jeff Callaway's campaign during the UCP leadership race. Notley said she plans to bring forward a detailed plan to "significantly" expand affordable child care in the budget. However, timing of the budget is still up in the air, as it appears the government won't release one prior to the election. The government is committed to building a new high school in north Calgary, the speech said, and expanding the Red Deer Hospital to increase the size of the emergency department and add a cardiac catheterization lab. Renovations to the emergency room, mental health and lab spaces at Peter Lougheed hospital in Calgary were promised as well. The government repeated its commitment to building the Springbank Dam, a key part of the flood mitigation plan for Calgary. The speech said the government wants to invest in a rural broadband strategy. The government wants to help more Albertans finish high school and provide English-language training to those who need it. The classroom improvement fund will get a boost. If elected to a second term, Notley said, she wants to close some of the loopholes in election financing rules that allow big money in politics. Her government has made changes, such as banning corporate and union donations to political parties, but she said more needs to be done. After the election, Notley said, she wants to set up an all-party committee to review the Election Act to identify what needs to be changed, while respecting the Canadian Constitution.